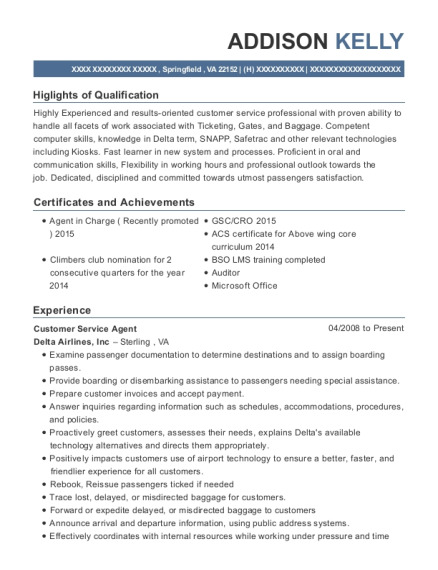 To obtain a freelance position in desktop publishing where I can utilize my layout and design skills. Over 16 years experience in desktop publishing. Works well independently or on a team. Highly productive managing projects; a creative problem solver who rapidly adapts to changing demands. Train new editorial users for The Record, Herald News and weekly publications in Quark, Word, and Prestige. Collaborate with graphic artists, editors to create and maintain master templates, stylesheets and libraries according to design specifications. Manage Prestige user accounts (deleting/adding users as needed including queues, adjusting permissions for existing users, change passwords, ensure messaging lists are accurate, for 350 plus users). Troubleshoot user problems, both immediate basic functionality and deeper, recurring problems ( Word, Quark, Content Manager, Web Client and XML2PLA). Maintain each site's environment within the Prestige production system (ensuring pub info is accurate; create and maintain queue structure, workgroups and workflows; maintaining system elements and parameters; and adding/deleting metadata, fields and dropdowns, as needed). Also, create new sites if needed. Coordinate installation and update of software system with staff and outside vendors. Create SOP's for Editorial and System departments. Responsible for laying out and proofing educational workbooks. Responsible for managing and hiring pagination staff. Create and edit new layouts of newspaper pages on daily deadline basis. Create and edit graphics for news print. Assist paginators and editors with production issues..
Output pages to plate under deadline. Work with editors and paginators to get pages done to meet our nightly print deadlines on a daily basis. Collaborate with graphic artists, editors and writers to create and maintain master templates, stylesheets and libraries according to design specifications. Assist paginators with production problems. Create and edit layouts of newspaper pages on desktop computers on a daily basis. 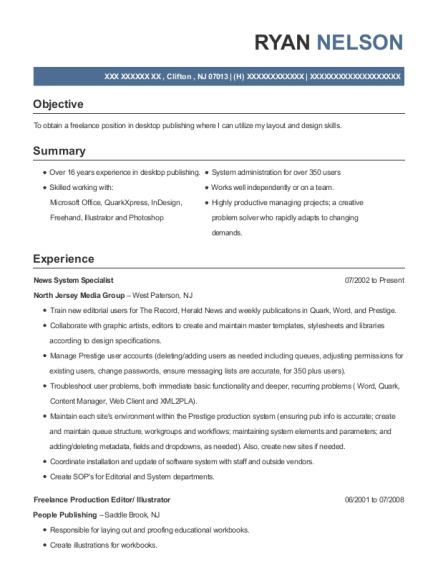 This is a resume for a News System Specialist in Clifton, New Jersey with experience working for such companies as North Jersey Media Group and People Publishing. 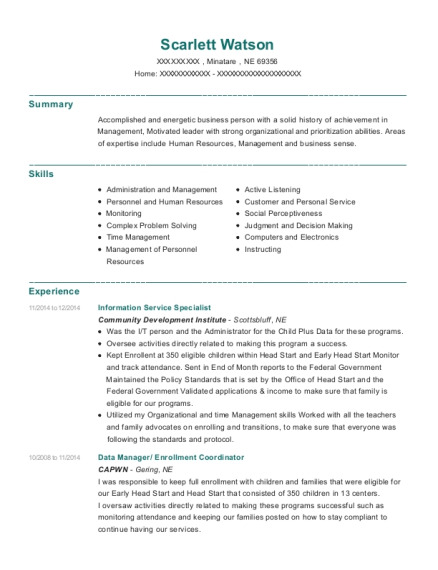 The grade for this resume is 0 and is one of hundreds of News System Specialist resumes available on our site for free. 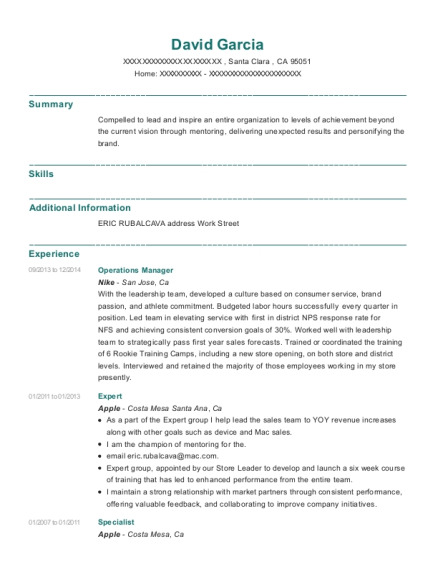 Use these resumes as templates to get help creating the best News System Specialist resume.